Posted on November 2, 2018 at 5:54 am. The Kindness Club will be collecting candy before school — TODAY, MONDAY and WEDNESDAY of next week — in the donation bin located outside of the cafeteria. The Halloween Candy Donation Drive — Give what you can, and help spread kindness to others! And now it’s time for WOLF PACK PRIDE!! The boys Ultimate team defeated Kenmore yesterday 13 – 0. Nothing could stop the offensive line — not even the gusty wind! The Best Buddies Club will be meeting TODAY during WOLF TIME. Members and allies who got a PASS to attend should go to room 108 immediately following the Morning Announcements. It’s a chance to make friends — and make a difference with some amazing kids. See you there, and thanks, Buddy!! Up next, we’ve got a special opportunity for all you book-lovers out there. Ms. Cameron and Ms. Edme are launching an all new Williamsburg Book Club — TODAY during all grade-level lunches in room 110. 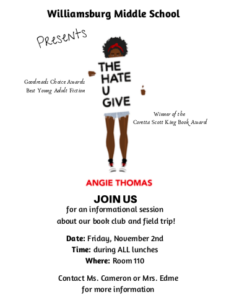 The first featured title will be “The Hate U Give” — winner of both the Goodreads Choice Award AND the Coretta Scott King Award. Interested “readers” are encouraged to attend! Just grab your lunch and head over to room 110. Could your parents survive a day in Middle School?! This fall, WMS welcomed over a THOUSAND parents to Back to School Night — giving them first-hand look at what their kids do everyday. WOLF-TV student reporters Miles M., Sarah, C., and Mason H. were on the scene — and they’ve got the “inside scoop” on what happens when our parents and teachers get together. Check it out! And now for an important announcement from our school librarians! Do you have any OVERDUE LIBRARY BOOKS??? If you checked out a book from the school library in September or October — then it’s probably about time to turn it back in. Teachers will be passing out overdue notices in TA next week — and students are asked to PLEASE look in your lockers today and at home this weekend for any overdues. How do YOU get around town? The Mobile Commuter Store will be visiting Williamsburg next WEDNESDAY during all grade level lunches. You’ll be able to purchase “Student SmartTrip Cards” — which provide for discounted rides on ART buses, Metrobus, and Metrorail. The cards are just 2-dollars to buy — and then you can charge it with as much money as you’d like. See Ms. Mays in the main office with any questions. DC is a MAJOR sports town! And to help you keep up on all the exciting action, student-reporters Wil T. and Taha O. — that’s ME!! — are ready to report from the sidelines. Go get it! !